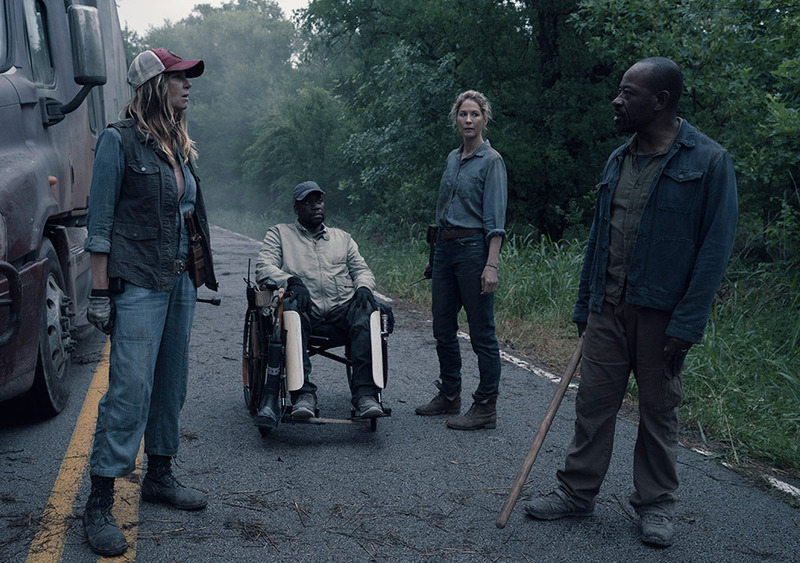 June (played by Jenna Elfman), Althea (played by Maggie Grace) and Morgan (played by Lennie James) search for Quinn (played by Charles Harrelson) but find no sign of him. They return when Sarah (played by Mo Collins) calls on the radio after she kills a walker with writing on him. The Mystery Woman (played by Tonya Pinkins) then radios and reveals that she killed Quinn to let him reanimate and be ‘what he was meant to be’. The Woman identifies Morgan by name (through Althea’s tapes) and demands they stop leaving supplies saying it makes people ‘weak’, she says she knows what Morgan is capable of and if he stays ‘weak’ she will make him ‘strong’ (turn him into a walker). John (played by Garrett Dillahunt) builds a raft to travel due to heavy flooding but Strand (played by Colman Domingo) has no interest in following him. The raft doesn’t support John’s weight and he’s nearly eaten by an alligator which having fed on walkers roams the area for humans or walkers keeping them stuck. 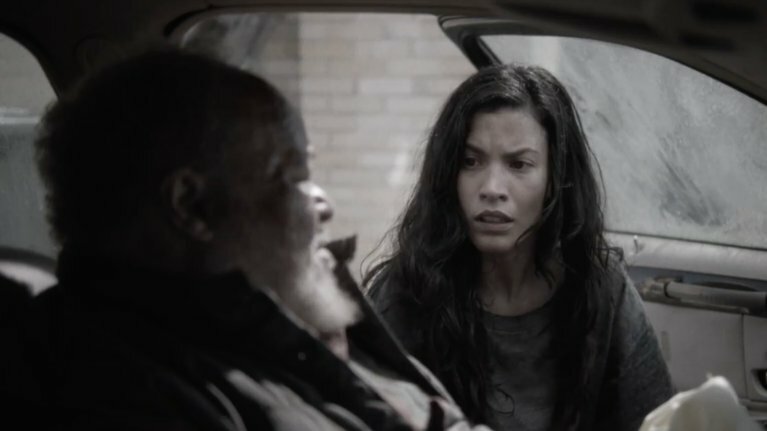 Luciana (played by Danay Garcia) travels to a public library searching for Charlie (played by Alexa Nisenson) but finds Clayton (played by Stephen Henderson) injured in a car and stops to help. Morgan is resolved to find and save everyone but when pressed about what the Woman meant about his past, he shuts down the dissent and threatens to steal the truck if he needs to. Luciana struggles to free Clayton from the car but realizes if she does he’ll die faster, instead she decides to find beer per his last request. Morgan lays down the law. This Woman is eerily similar to how Morgan was years ago on The Walking Dead; desensitized to people and half crazy. But her ‘mission’ is more destructive to anyone in her path and I doubt aikido lessons and someone to talk to will help her. She’s quickly growing into the main antagonist but even though we need to eventually find out her backstory and motives, for now the mystery around her makes her character all the more intriguing to watch. Luciana going to get a man his last beer on the surface sounds like the weaker point in the episode. But these kind of stories are usually good for character growth, admittedly hers is clearly about moving past losing Nick (played by Frank Dillane) but once she does maybe she’ll find a place in the main story. That alligator was a good thing for John and Strand in the sense that without it they would have separated almost immediately but now being stuck together there’s room for them to grow on each other. Also it’s fun when every once in a while the characters have to deal with natural predators in addition to walkers. Strand tries to scavenge a wrecked truck for parts but causes it to fall while fighting a walker for a bottle of wine, but manages to survive. John manages to construct a better raft and tries to convince Strand that he has things to live for other than drinking to forget his sorrows; in the end Strand agrees to go with him. Luciana goes on an extensive search but radios Clayton to say she couldn’t find beer but Clayton is still touched that she tried for a stranger. Clayton tells Luciana that he used to love being alone until the world ended and he realized how much he missed people, he says she can still help others even if she didn’t help him. Luciana then finds one of the supply boxes which includes the radio channel to reach Morgan and the others and a beer. She goes back to Clayton with the beer (cold from a first aid ice pack) and learns he was the person who originally left the supplies. John and Strand are attacked by the alligator on the water and their raft starts to sink, using walkers as a distraction they head back to shore despite John wanting to find a way to keep going. When you nearly die trying to get a bottle and think nothing of it that’s when you should realize you have a drinking problem. Strand lost just about everyone he cared about since the world ended so alcohol is more precious to him than water at this point. But his narrative is also about trying to live with others without always planning how to put his needs and safety above theirs. He was quick to abandon John in the sinking boat so he’s not there yet but with enough time he’ll get there. Luciana was all about not letting someone else die without trying to help them in some way, and in the process learned the inevitable ‘you can’t live without people’ lesson. She gave Clayton his last drink and is ready to find the others but when that happens what is Luciana’s story? If you were to rank every character in terms of importance to the narrative she is arguably the most expendable. She’s not a bad character just underdeveloped but that can all change if she finds a story that can propel her forward. Clayton dies and Luciana buries him, she uses the radio to thank the people for the supplies and is surprised when Morgan answers. They find Luciana and get a second surprise when Charlie and Alicia (played by Alycia Debnam-Carey) call as well and they go to pick them up. The Mystery Woman radios and expresses disappointment, Morgan tells her after they help their friends he wants to help her. The Mystery Woman than appears behind the truck and when she gets alongside she opens fire with the guns. Morgan and everyone finding Luciana was one thing, when they also located Charlie and Alicia that seemed too happy an ending for the episode. Right on cue Mystery Woman shows up and she’s pissed that Morgan didn’t listen to her about helping people. It was probably Morgan’s line about wanting to help her that drove her over the edge and had her gun them down, she may be crazy but she’s clearly not weak. Wendell (played by Daryl Mitchell) seems ill-equipped to handle things in a wheelchair. Then he used that spike trap built into the chair and you realize how badass he really is. If I had to choose I’d rather be eaten by a gator, looks faster than being slowly eaten alive by walkers.